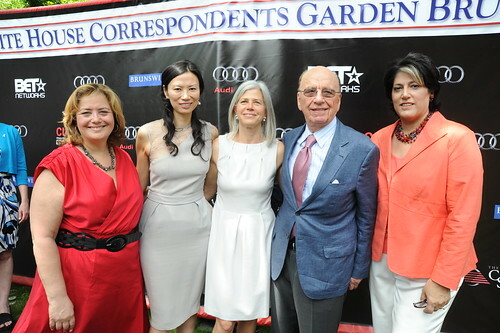 The 17th Annual White House Correspondents’ Association Garden Brunch was a historic one in that it marked the last year it was held at the home of longtime Washington TV executive and CEO of Haddad Media–Tammy Haddad. Attendees mingled outdoors in a Palisades location overlooking the Potomac, meeting old friends and connecting with new ones before the main event in the Hilton ballroom that evening. Guests included entertainment luminaries like Chevy Chase, Patricia Arquette, Kim Kardashian, Dana Delaney, Cheryl Hines, the Jonas Brothers, Demi Lovato, Joe Mazzello, Omar EppsAdrien Grenier. The Fourth Estate was well represented with guests such as Fox’s Rupert Murdoch, Wolf Blitzer, Arianna Huffington, David Gregory, Andrea Mitchell, Bret Baier and Gayle King. And the event once again honored two important causes – ending maternal mortality through Mothers Day Every Day (a partnership of the White Ribbon Alliance for Safe Motherhood and CARE), and supporting research for epilepsy through CURE Epilepsy.